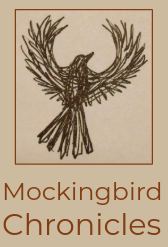 Welcome to the renovated Mockingbird Chronicles! Not a particularly interesting photo to inaugurate my new blog design, I know, and Google Collage randomized the pics, so it doesn’t automatically show the process. Still, this is a project I want to document. On Monday (Solstice), I went to my friend Sarah’s house and dug up a burdock. I planted it out in the woods’ edge where it should help to break up the clay. I took a piece of the root, and then harvested some curly dock root and some dandelion root. In the bottom center, the roots are all washed and waiting to be peeled (curly dock top left, burdock bottom left, and dandelion to the right). Right center: Peeled. I let them dry overnight, and the next morning Jon said what I was thinking: “They look like bones.” Burdock is top left, dandelion top right, and curly dock is in the bottom right. The bottom left photo shows them in their jars after about four hours in the dryer (dandelion and curly dock on left, burdock on right). Now for tea. Today’s prompt is to write a lune, which is sort of haiku-like, and can be on any subject. It’s a syllable-count poem of 5/3/5. These tiny lines of two or three (as in lune and cinquain) are really challenging. I might try some of these that break the line endings, but I have a feeling that there needs to be a purposeful ending to break up the longer lengths. It might be interesting to do a series of lune and haiku, interspersing them. And a lune, of course, is moon-shaped, so it might be interesting to take the sense of that instead of the specific directions and do a 7/5/3/5/7, or even a 9/7/5/3/5/7/9. Oooh. The possibilities! 1. Shakti energy. That is to say, the will and the fire to find the way and to dive in to the process. 2. The roadside flowers of late June: always Queen Anne’s Lace, Chicory, and Day Lily, but also Buttercup, Sweet Melilot, Hag’s Taper, and lavender bubbles of Vetch. 4. Yoga. Stretching the spine, balancing, breathing–they’re so much more than the simple acts of stretch and balance and breath. Those are words that fill other spaces and other meanings throughout the day. 5. Date night tonight! I don’t know when we last planned a date for just us. I feel so adult.